I couldn't believe it when, after placing my order from South Africa around midday on the Wednesday I got a call from the UPS courier on Friday morning at 11:00 informing me he was 5 minutes away from my office with the delivery! This absolutely made the experience for me. EXCELLENT SERVICE. Swapped these out from my standard Axis 2.0 Brakes on my Tarmac and these make a massive difference. Improved my confidence when descending and the black finish also looks great. Cannot fault 105 for best bang for buck, and the Merlin price was, after much shopping around unbeatable. Great price, speedy delivery and well packaged. Bought to replace the older 5700 model. Found them harder to install and adjust as the quick release cam covers the bolt head for the brake pad. Highly recommend these brakes. After using BR-6800's on another bike for 2+ years, there's negligible difference between those and these 5800's. Excellent set of brakes for the money. 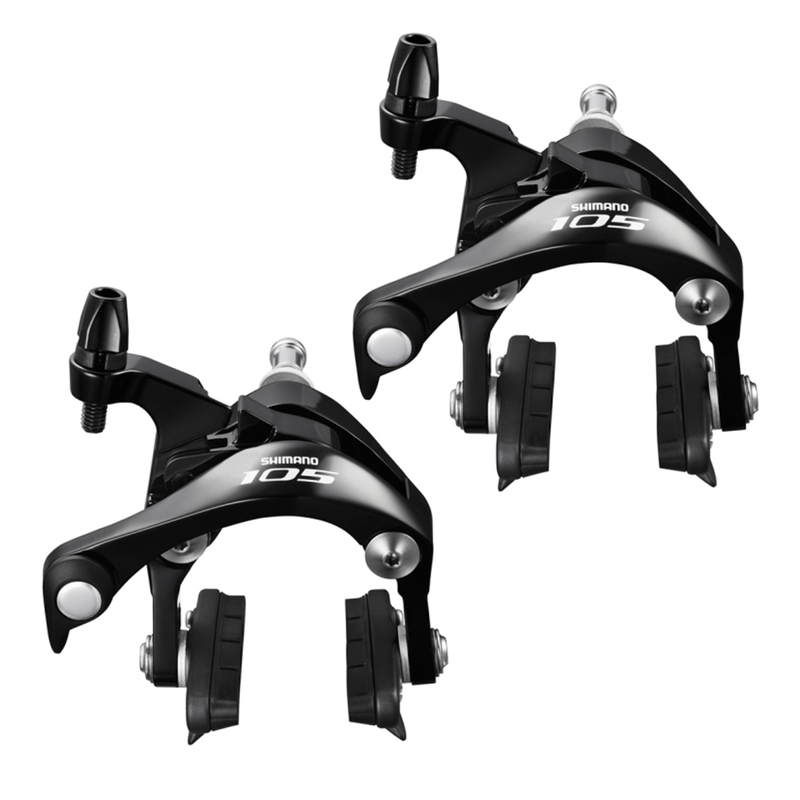 I bought these to replace the Axis1.0 calipers on my 2016 Specialized Allez. They fit easily and work very well with the Sora 3500 levers that came with the bike. Their extra stopping power is immediately obvious as it the use of less effort at the levers. So scrubbing off a little speed is easier and more precise. These are great value calipers with excellent stopping power. Unless you're fastidious about weight, I can't see why you'd pay more for Ultegra or Dura Ace. Ordered these to complete the full 105 drivetrain on my winter bike. Really impressed with the stopping power. A lot better than the cheaper shimano calipers that they replaced. Ordered from Merlin as the cheapest price around. Delivered fast and well packaged (as always from Merlin). Good item, a large improvement in both feel and performance from the standard brakes that were fitted. I replaced the factory fitted Tektro calipers on a friends Giant Avail SL1 with these calipers & at the same time removed the extra 'top mount' levers that Giant fit to compensate for fitting inferior callipers? Result = The amount of force/pull required on the STi levers is now a lot less for the same stopping power & better modulation also. The quality of the Shimano brand is well known and these calipers are no exception. Vast improvement on the generic brakes fitted on the bike both in looks and function. These are supplied as a pair (one front and one back). The only difference is the length of the fixing bolt and spacer nut. I have docked one star because only one length of spacer is supplied (different for front and back) and I had to re-use the longer spacers from my old brakes for a good fit. Great Shimano quality and performance. Easy to fit and adjust powerful braking and looks great. No frills brakes. Bought to replace my tektro stock brakes that came with bike. These are infinitely better. Much more modulated and responsive than the 105 10-speed model on my older bike. A significant upgrade. I upgraded from Shimano Soras and so far the 105s are working great. They were easy to install and brake pads were very easy to replace. The black finish looks great, it is glossy but not over the top. The stopping power works well so far on my Reynolds dv3ks. I purchased this 5800 105 brakeset as an upgrade to the stock Tektro brakes that came on my bike. The absolute stopping power of these 105 brakes is mo-o-o-ore than stock brakes, the feel at the brake lever is much better, very solid feeling. I love the design. Best upgrade for my bike. Best brakes for this price 100%. Bought as a replacement / upgrade to rebranded Tektro units on a Merida road bike with 5700 series groupset. Lots of conflicting online talk about compatibility of these 5800 callipers with earlier STIs. However Shimano's charts suggest all should be fine and have to agree. Very good initial experience so far with fit and feel, particularly modulation. Not grabby, just easy feed of power (I now feel able to stop my 90kg+ frame on steep descents to road junctions). Rate 6800 Ultegra higher on finish and perhaps overall feel but these work on the N+1 bike being upgraded perfectly given other components are 5700 (105) focused and black. Not yet fitted but known to be excellent brakes as I already have a set on another bike. So much better than Tektro offerings (often rebranded) on low-mid priced bikes. Powerful braking and looks great. Easy to fit and adjust..Great Shimano quality and performance. Replaced for Tektro and works well with Tiagra levers also more softer with Ultegra brake control cables. Easy to fit and set up. Do the job well. A lovely upgrade on previous brakes. I swapped out the stock pads but nice to have spares for when I go back to alloy rims. Fast delivery too. Looks good and offers great modulation. Powerful braking and definite improvement on the previous model. Looks great, sleek and stylish with excellent stopping power. Bought these for my Grandson's first road bike. Great Shimano quality and performance. Terrific upgrade to my Tiagra caliper brakes. They function as well as the Ultegra level brakes but don't cost as much. Great brakes. Bought these to replace the Axis 1.0 brakes that came on my new bike. So much more powerful with greater feel. A really cheap way to significantly improve your ride. Very impressed with these brakes so far. Very easy to setup and adjust. A huge increase in performance compared to previous brakes (Tiagra ca. 2012). Using with old levers but still working well, great modulation and stopping power. Only used for the daily commute so can't comment on longevity but the quality feels excellent. Excellent price and service from Merlin too. I bought these to replace the non-series brakes on my partners Liv Avail which is otherwise equipped with Shimano 105 parts. They are a big improvement over the non-series brakes and are now fully compatible with the 105 levers. Great value from Merlin and great service as always. These are a great improvement over my 10 year old original calipers. Easy to fit and set up. Increased stopping power noticeably. Good price from Merlin too and very fast delivery. Purchased these to replace the awful calipers on my allez. They certainly make a difference in terms of performance, not a massive one but better none the less. The main advantage is the ease of adjustment compaired to the tektro, for anyone with an entry level bike I'd recommend these as an upgrade. As ever great service from merlin. Brought these an a upgrade to some stock brakes on my winter bike. What a difference these made, strong braking which gives me a lot more confidence now. Strong, reliable and responsive brake set. Set up right, these do the job perfectly. Upgraded the brakes on my wife's Orbea, and she says that she didn't know that brakes could feel so good, strong and easy to modulate. Four thumbs up! Good looking brake clamps , replaced a Tektro 580. Tried them out on a mountain descent over the weekend, the pads seem to be more rigid than the swisstop salmon I previously had, which were all weather and softer. Will give the pads more tme and see if I need to replace them altogether. The Callipers that I bought with my bike were insufficient so I changed them for these brake Callipers of Shimano 105 from Merlins instead. I would recommend this product to anyone who wants to stop well in all weathers of both wet and dry. Excellent product! Excellent callipers delivered with the usual excellent Merlin service. Not as light as the Tektro units they are replacing but way more powerful with greater modulation and feel.